Six weeks ago, The Daggers Diary team were fortunate enough to attend the semi final between Inverness and Hearts, while on a weekend trip to Edinburgh. As one of the more attention grabbing games that they had attended in a long while drew to a conclusion, they were offered tickets to the final if Inverness (down to nine players at this point) held on and won the tie. Of course it was a no-brainer that they would go. As we strolled back into the city centre with the game still very fresh in the memory, we wondered how we were going to break the news to Dan’s wife that we would be attempting to head to Glasgow for the final. Those twenty minutes or so were spent trying to come up with kind of story that would tug on the heart-strings, and at least allow Dan out of the house for a day trip to Scotland’s second city. Unfortunately, the walk produced nothing of note, and so when we all met up, Dan just asked outright. Luckily, there was swift agreement, and so it is how we find ourselves on a flight up to Glasgow from Stansted on a bright sunny Sunday morning. Our main concern was tickets. The average Inverness home gate isn’t huge, and so while we were assured by our contacts that tickets wouldn’t be a problem, I always like to be a bit on the cautious side. Dan though found a decent flight and so went ahead and booked it. Confirmation of the tickets came through a few days later, and now we were off to the 68th Scottish League Cup Final. Unusually for any flight, there appears to be space left in the overhead lockers, although given that there are quite a few Aberdeen shirts on the flight many will be presumably doing the same as us, and heading back straight after the game. 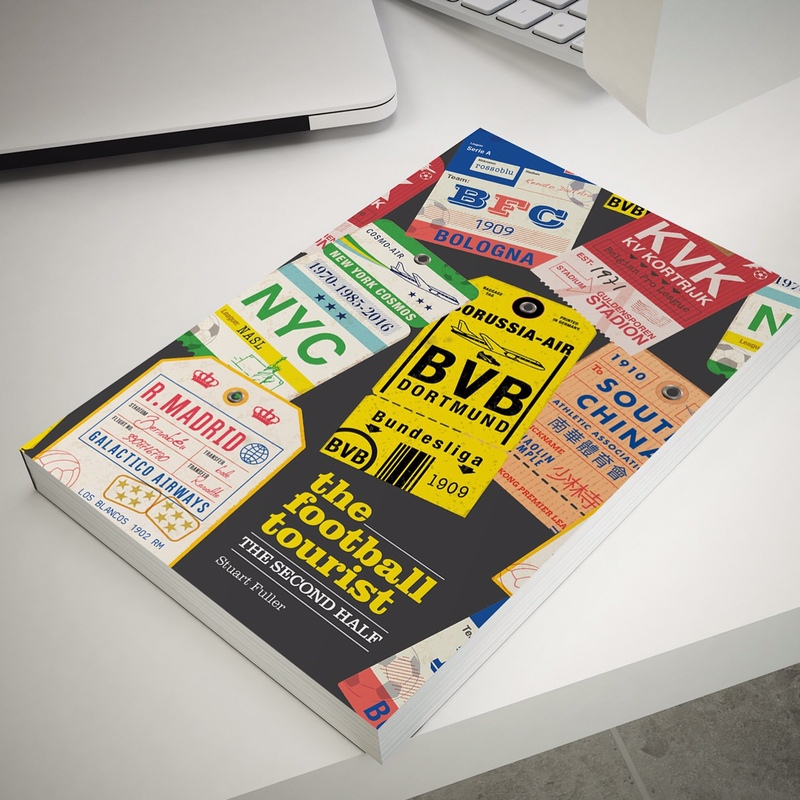 Doing the occasional trip into Europe to visit various footballing outposts has meant that when either of these announce these trips, the eyes of those may roll a bit, but there is generally a shrug of the shoulders and a shake of the head. Occasionally, we get a double take, and this trip has definitely produced that reaction. I think most people would have given up being surprised by anything we do by now, but it’s nice to know that our jaunts still gave the ability to surprise even those that know our travel history so well. Our flight north is full, and has quite a few red and white scarves to go with plenty of Aberdeen shirts that are being worn. Given that this is the first final for Aberdeen in almost twenty years, it is not that surprising, but to find that many travelling from the South East of England is impressive. What is also impressive is the sight of Celtic Park as we leave the train at Bridgeton. 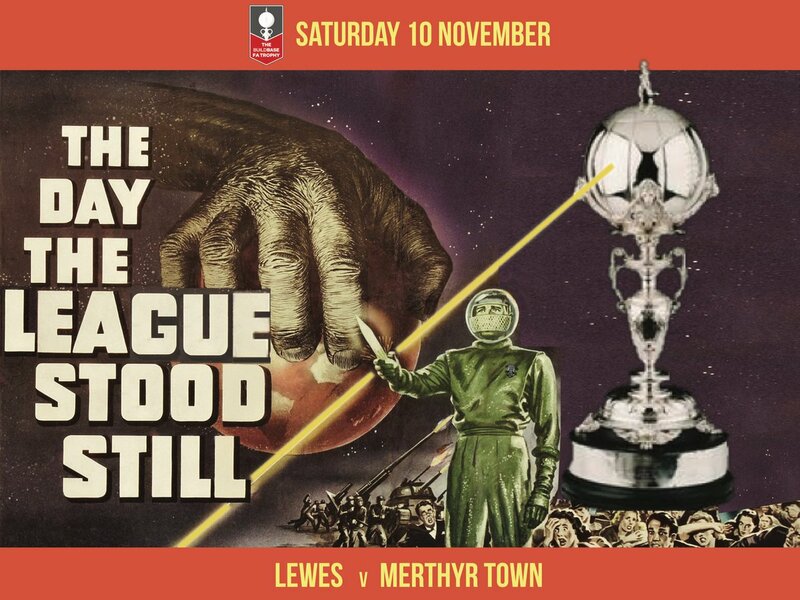 We arrive, but are not the first there, and there are already supporters from both teams milling around the stadium, although as in the town centre, there is much more Aberdeen red than Inverness blue. There are plenty of pictures taken, including of Jock Stein holding the European cup, and the Sir Chris Hoy velodrome that is located across the road. The image is slightly ruined by the presence of diggers working around the stadium, on improvement works outside the main entrance. We complete a lap of the stadium before finding our entrance and going into the stadium. There are the obligatory security checks to go through, with bags checked before we are allowed to enter the stadium. Once through, we head straight for our seats, and the view as we clamber up the stairs to the arena is impressive. 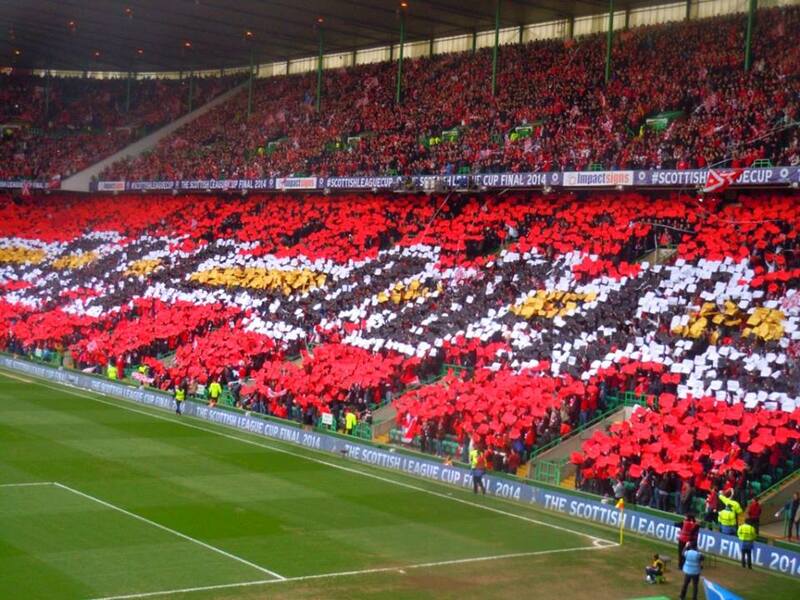 The rest of the stadium is decked out for a pre-match display by the Aberdeen fans, but given that this is our first visit to Celtic, that doesn’t matter. The stadium is magnificent, and even before we have seen a ball being kicked, we have both agreed that we would like to return for a Celtic game. As kick off approaches, the stadium starts to fill up, and upon emerging from their respective dressing rooms, are warmly welcomed by their own fans. Being outnumbered by about 5-1 means that the Caley Thistle support will have its work cut out to make themselves heard above the vast swathes of red, but they give it a go anyway. The first incident comes only a few seconds into the game. Aberdeen play the ball into the front players, and Jonny Hayes goes flying through the air in an attempt to win the ball. All he does though is miss the ball, and come crashing down to the ground with a large thump. This brings a few minutes of treatment on the pitch, and while he does return, within five minutes of kick off, he is being replaced. As expected, Aberdeen take some time to adjust, but it also appears that the same applies to Inverness, and the game is slow to recover from this early change. The closest either team comes to a goal in the first half is from a shot by Anderson, which smacks against the post, flies across the line and is cleared from the other side by Richie Foran. Aberdeen curse their luck, while there is a collective sigh from the Inverness section. Passes from both teams are going astray, and while Inverness do eventually apply some pressure, they don’t really trouble the Aberdeen goalkeeper too much; his main problem is dealing with the balloons that periodically appear from the stands, and leave the penalty area looking like the aftermath of a battle fought by two balloon armies. The second half was much better by Inverness, although a free kick by Tansey was dealt with comfortably by Langfield. There was also a promising moment for Watkins, but his air shot was greeted by unconfined joy by the Aberdeen support, while at the other end, both Jack and Robson went close. As the whistle sounded for the end of ninety minutes, Dan produces a list of train times for our journey back to Edinburgh, for our flight home. Allowing for the walk across town to catch our train, we are confident that we should have plenty of time, although we really don’t want to go through the agony of penalties. Extra time does not produce a winner, and so he list is back out, in that awkward gap before the shoot out commences. As with the semi final, the penalties will be at our end of the stadium, and so with everyone standing, we get set for the few minutes that will decide the final. First up is Billy McKay for Inverness, but his shot is saved. 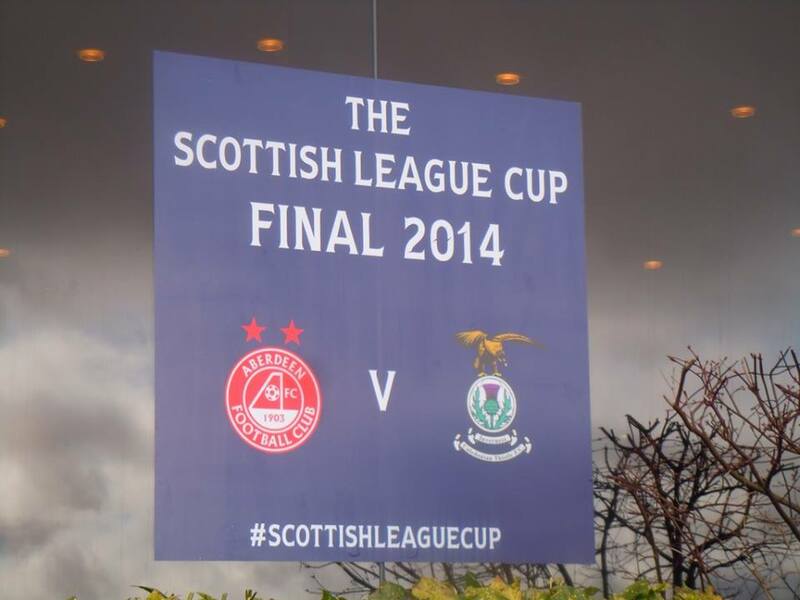 This is the way the semi went, but Aberdeen fail to read the script by scoring their first. Next up is Greg Tansey, but his penalty flies over the bar and into the Inverness support. Hope is now draining away, as Nicky Low makes it 2-0. The next four are all scored, and so as Adam Rooney makes his way forward, this could be the kick that wins the final for Aberdeen; his shot is planted into the back of the net, and that is it. The majority of the stadium celebrate, while those from the Highlands can only think of what might have been. As the Aberdeen players and fans celebrate, Dan and I make our way out of the stadium. We say our goodbyes to the Wilkie family, who had been good enough to get our tickets, and make promises to visit next season. As we make our way from the ground back to the train station, there are only a few red shirts and scarves on display. Most of those leaving are wearing blue, and it seems to be the only colour on the train back into the city centre. The result takes a few hours to sink in, and it is only as we leave the local branch of the golden arches at Stansted, just after 11pm, that we start to mention the game again. It has been a great experience to finally go to my first domestic cup final, and we have been lucky to have met some good people who seemed a bit surprised that we knew about Caley Thistle when we first started speaking. To watch the club in their first major final was a piece of history, it is to be hoped that they will reach a few more, and that we are there to see it. 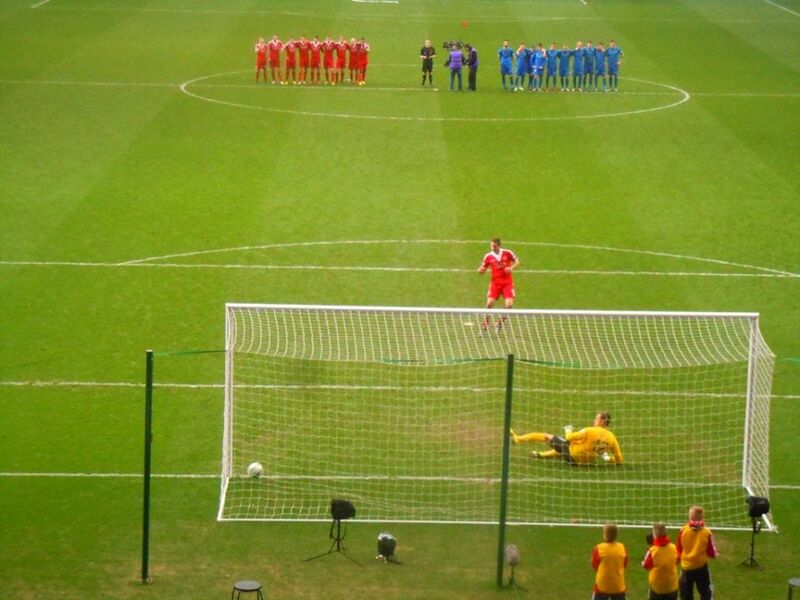 On the day, Aberdeen edged the game, and held their nerve in the shoot out, and so deserved the win. Prior to the game, I had been shocked that they had gone so long without winning a trophy, although that would have been bed on the fact that when I was younger, Aberdeen and Dundee United both had teams that more than matched both Celtic and Rangers. It is a pity at the moment, that the game north of the border can not produce those times again. This entry was posted in Scottish Football and tagged Aberdeen, Celtic Park, Glasgow, Inverness Caledonian Thistle, Scotland. Bookmark the permalink.